Saint Joseph Catholic Church is a former parish of the Roman Catholic Diocese of Davenport. The church is located in Davenport, Iowa, United States, at the corner of Marquette and W. 6th Streets. It is listed on the Davenport Register of Historic Properties and on the National Register of Historic Places. The church building currently houses Grace Fellowship Church. Its school building houses Marquette Academy, a private non-denominational elementary school. The parish, which never had defined territorial boundaries because it was established as a German ethnic parish, continued to decline in numbers and it was also closed in 1999. The building became a part of Holy Trinity Mission School. In 2008 the church and rectory were purchased by a non-denominational congregation and it became Legacy Church. 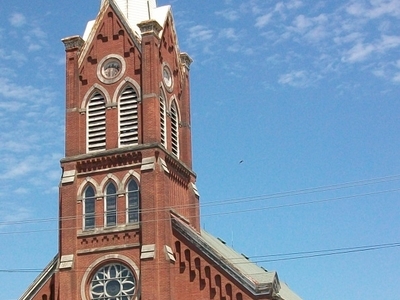 Here's the our members favorite photos of "Churches in Davenport". Upload your photo of St. Joseph's Catholic Church!